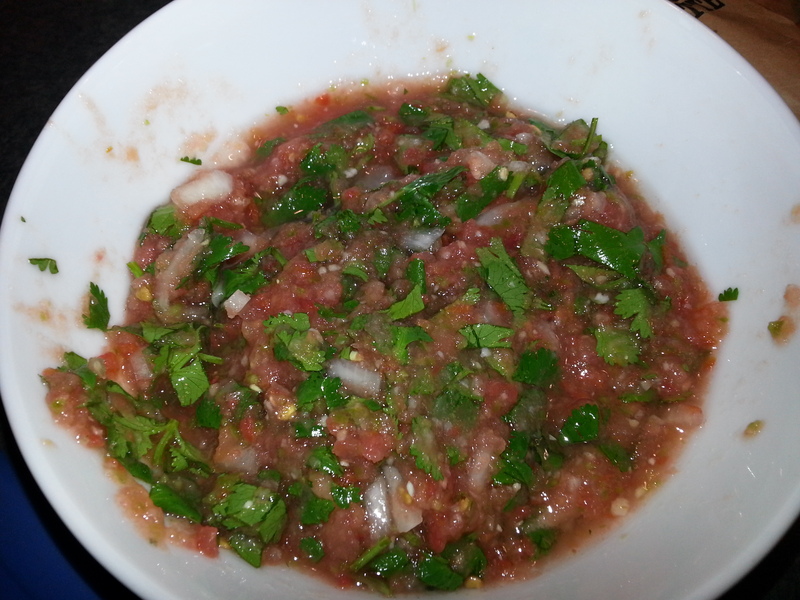 This salsa is fresh, simple, easy to make, and absolutely delicious. Place tomatoes, ¼ cup onion, jalapeno and garlic in the food processor, and puree. Stir the final quarter of the chopped onion, the cilantro and the lime juice into the mixture. The thing I learned while making this salsa is that it’s better after a couple of days sitting in the fridge. It was tasty on Tuesday and Wednesday, the flavors had melded somewhat by Thursday, and by Friday it was perfectly balanced. This was much better than my first attempt, but it’s a long way from perfection. I’m always scared of trying to make a salsa, but I love salsa so much. I gotta put my big girl pants on and try it!